Want a gadget that will really wow the folks this Christmas? Do the Xbox One and PS4 not cut it for you? Or is a Lamborghini smartphone not ostentatious enough? Well, look no further. 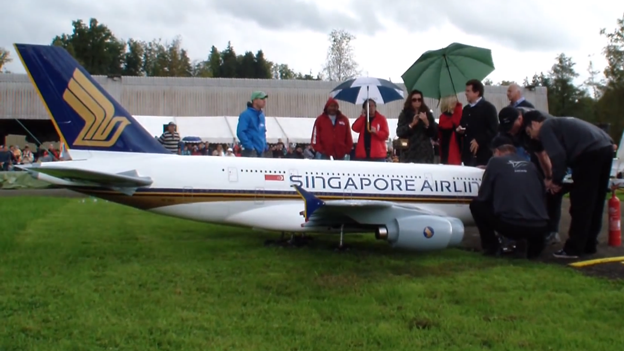 How about a 16 foot long scale remote control model of a Airbus A380? That's more like it? Sadly, it's a one off and isn't for sale. Built by Peter Michel, the model took “eight month, 5,000 working hours and a whole lot of Styrofoam and lightweight balsa wood” to get it into the air. A video of it has gathered more than 2.7 million hits at the time of writing. You can view it below. According to the video, the plane is 15.8 foot (481 cm) long and has a wing span of 17.4 foot (530 cm). Unfortunately, as it is a one off, it isn't for sale. And even if it was for sale, it wouldn't be cheap. Each engine alone costs $3,300 (£2,025), and that is an uncustomised engine. And that is without even considering running costs. The model has a 2.6 gallon fuel tank that burns through 0.3 gallons a minute. That's £18 to fill the tank. And even then, you'll only be able to run it for just over eight minutes. But that engine roar is totally worth it. Creator Michel has not said how much it cost him to build the plane, but knowing the price of those four engines alone is enough to make us shudder. In the meantime, why not check out our Christmas gift guide with some awesome ideas at a price that is less likely to result in your wife/husband/children disowning you.